Can I tell you something strange? Sometimes, my favourite part of my day is the drive to and from work. I know, it's weird. There is usually a ton of traffic, lights that change at just the wrong time, and roundabouts that are basically a please-don't-hit-me-merry-go-round. But it's also the time I listen to my podcasts. Although the concept of podcasting has around for years, it feels like everyone and their cat is embracing the potential of an audio outlet recently. The creators have a new platform, and their listeners have something useful to do in previously 'lost' time spent commuting and completing their boring-but-necessary tasks. You can learn something about the world on the bus to work, hear an interesting opinion while doing the dishes, or be inspired as you fold your laundry. 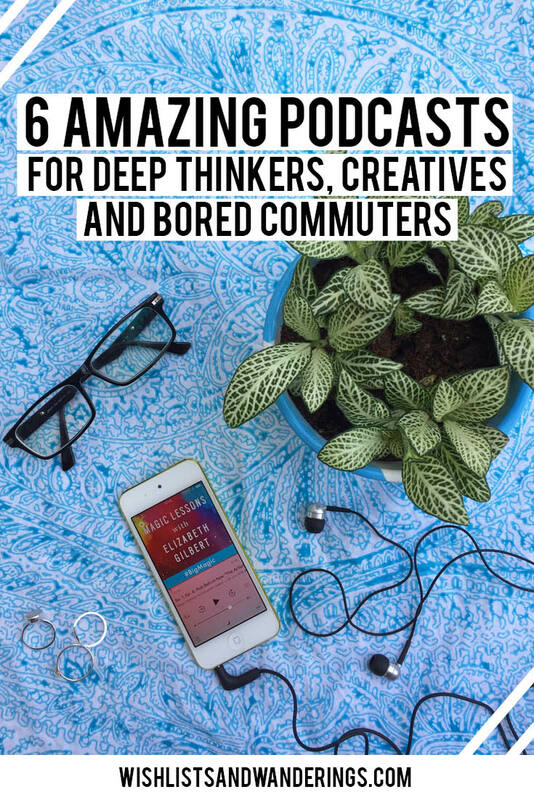 Whether you've never opened the Podcasts app on your iPhone or are a junkie who has run out of episodes, I've put together a list of some of my favourite shows that are worth subscribing to. Onward! This show was my gateway into the world of podcasts -- Apple's algorithm suggested it, and I'm so incredibly glad that it did. On this show, Jess Lively interviews a range of amazing guests about how they got to where they are, their philosophy on life, and the struggles they have faced and overcome. It has introduced me to new authors and ways of thinking, as well as inspiring YouTubers, blogs, and other podcasts. Recently, the podcast shifted to include more personal insights and lessons Jess has learnt on her travels. She is also the lady behind an online course called Life with Intention Online, so the episodes are infused with her perspectives on the inner sources of individual actions, living from your values, and finding your 'purpose' in life. There are over 170 episodes in the archives, so you can go all the way back to the beginning and binge-listen up until the present day. Creatives will love Grace Bonnie's inspiring and spunky (that theme song!) podcast. The author and Design*Sponge founder interviews ice cream makers, designers, bloggers, ceramicists, interior decorators and entrepreneurs (among others) about their creative pursuits and companies. She also provides tips on work/life balance and productivity, and offers interesting insight into running a creative business and the shifting world of online media. While this podcast isn't currently active, there are 100 episodes in the archives to keep you inspired. Billed as a podcast for 'curious, big-hearted, purpose-driven creatives', Jen Carrington's episodes showcase a softer side to the creative space. The creative coach interviews a range of entrepreneurs, bloggers and artists about living a fulfilling life that is true to their personalities and values. It uncovers some lesser-discussed downsides of owning your own business, offers tips and motivational insights, and discusses related issues like imposter syndrome and unproductive hustling. This quick and informative podcast, presented by Greenpeace, answers all the strange questions you never knew you needed the answers to. From 'What does the sun sound like?' to 'Are there lazy ants? ', if listeners have a question, the hosts and a range of experts will reward their curiosity. They're usually under 12 minutes an episode, so watch out all you'll smash through them in a week and spend the next month thinking about touch-me-not plants and spider rain. This beautifully produced podcast delves into the topics most people don't want to discuss -- hence the name. Host Anna Sale interviews everyone from former football stars to prisoners, asking some pretty sensitive questions and gaining some unexpected answers. The show can go into some difficult territory, but if you've got an open mind and some time, it will show you how similar we all really are. Elizabeth Gilbert's warm voice and encouraging words are a lovely way to start your day (seriously, it's like an audible hug). In this podcast, inspired by her book Big Magic, she reaches out to people who feel stuck in their creative lives, and coaches them out of their rut. She also brings in an array of successful artists to ask their advice, from Humans of New York's Brandon Stanton to Wild author Cheryl Strayed. Liz's views on creativity are applicable even if you're not a master painter or award-winning author -- there is a lot of wisdom that can be applied to listeners in many different personal situations. Are you a podcast fan? Have any inspiring or thought-provoking ones you'd add to the list? Let me know in the comments! Like this post? You'll probably also want to check out this list of (free and cheap) online courses for digital marketers, social media managers and creatives. Save this for later: Pin the image below!